I like organization and data. In some ways this makes me a little odd, but I know that lots of people work this way. In this post, we are going to share some different ways you can keep track of your gaming habits as an individual or as a family. These are just a couple ideas and apps to get you started. This was my first game scoring app that I checked out a couple years ago. The app has become more stream lined and has some really great features. While this app is only available for Android phones, Score Pal does some things that I really like. At the most basic level you can add players, games, record scores and sync them to the Board Game Geek (BGG) database. The game tracks users wins/losses and how often they play together. One thing I loved about this app is that you can create groups that you frequently game with. This is really useful for gaming with the same family members, co-workers or a gaming group. When you add a game to the app, it allows you to check out different scoring variants which was my favorite part of this app. For instance, there is a variant for Herbaceous that breaks down how many points you score in each of the pots you plant in. It was awesome to look back and see how people primarily scored points during a game. This is a feature that really sets Score Pal apart. Easy to use and very little learning curve. Scoring variants for different games are my favorite. Grouping players help when gaming with the same people regularly. Syncs with Board Game Geek account and Google Drive. Only available on Android devices. Does not offer deeper analytics like some of the competitors. This app is a great option for both iPhone and Android users. 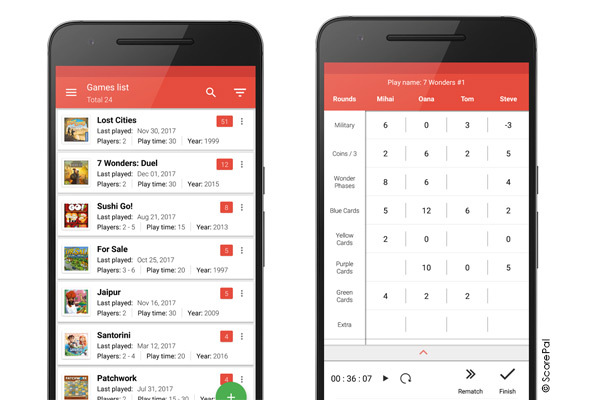 Similar to Score Pal, this app lets you track game plays, add players and sync to your BGG account. Eerko has done a great job of giving players stats that they may not even know they cared about previously. I’m really impressed how this app breaks down each play of a game and gives you analytics in a number of ways. You can look up a game and pull in the artwork and information from the BGG database and it has a very clean design. The app will rank players according to games and also allows you to post your scores to Twitter and Facebook. This is definitely the app that very analytical people will want on their phone. I feel like they missed the mark on having scoring variants for different games like Score Pal does. The app allows you to record the final score and type in details of the game that was played. 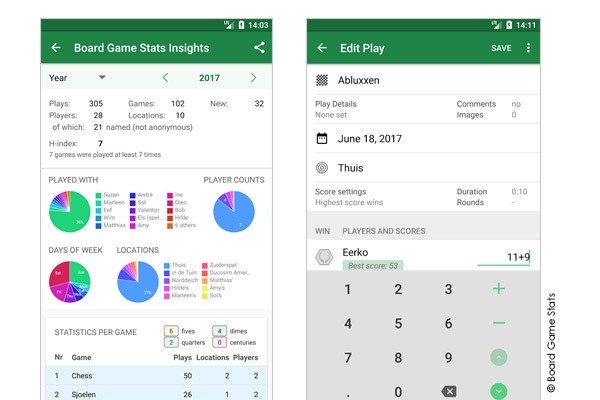 The Board Game Stats app allows users to mark games that are cooperative which is great for games like Pandemic, Forbidden Desert or The Big Book of Madness. Users can also purchase add-ons (only 99¢) that allow them to create challenges like a “10 x 10 Challenge” or even record X number of plays. 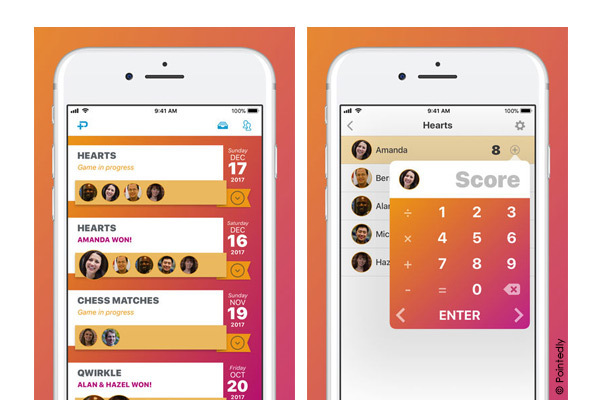 This app will require you to put in some time to really understand all the features but is a great choice for people who love numbers. Deep statistics and really nice graphs and charts. The option to define cooperative games is a great addition. Challenges add-on is a nice touch for only a dollar. Will take some time to dig through all the functionality. Some items being locked as a paid add-on will turn some people off. I really like the look of Pointedly and for the casual gamer this may be the app for you. The app is free but only available for iPhone and iPad users. The app is supported through users who choose to tip within the app itself. The app is very user friendly and players can be added directly from your phones contact list. You can assign photos to each of the players and it really makes scoring look good (this feature is also available in the Board Game Stats app). This app is more bare bones than the other ones I’ve covered. You can add games, players and record scores but none of these things are connected to BGG. If you’re not looking for deep analytical data and just want to records scores and rounds, this will do just what you need. The team working on this app seems dedicated to making it something useful for the occasional game night. If you have an Apple device, be sure to check out what Pointedly has to offer. Simple and straight forward app. Replaces the need for scoring with paper and pen. Games can be broken out by rounds. Very nice design and is absolutely free to use. Doesn’t give deep stats and data that some people may want. No integration into the databases of Board Game Geek. Do you have an empty spiral notebook around the house? If your kid is in school you probably have a couple laying around the house somewhere that you bought at Target for under a dollar. Grab one of these notebooks and now you have your own Family Gaming Journal. A couple years ago we started recording all the scores from the games we played in an old spiral notebook. When people came to play games at the house, the notebook sat on the table ready to keep track of how badly someone lost. The notebook is full of memories and cool little doodles that happened while someone took an hour to come up with which card they wanted to play next. It’s nice to get back to pen and paper and leave the devices behind while you game. The notebook is cheap, you can record the stats you want and drawing little pictures is a lot of fun! Simple, easy to use and found in most homes. Gaming notebooks are really cool to flip through when feeling nostalgic. Gives you the opportunity to leave the digital device behind. No connectivity to databases, the Internet or BGG. You might lose the notebook at some point. In 2017 our family tried the 10 x 10 Challenge. Play 10 games, 10 times each during the year. Honestly we were terrible at this. We failed the challenge but ended up making lots of memories. One of the best things we did was adding in the element of recording wins on our 10 x 10 Challenge chart. When a player won a game, they got to color in a meeple. It was really rewarding to see the kids get excited about recording their wins. It added some extra fun to the challenge and allowed us to keep track of who won the most games. We have two charts in PDF format that your family can download for free to start recording your wins. This is just another option for tracking wins and the games that your family plays the most. Free and doesn’t require an app. Easy way to see who wins the most in any particular game. Very basic and doesn’t give you a feel for how close a game might have been. These are just a couple ideas to explore as you keep track of your gaming habits. There are always apps and ideas that we don’t know about. If you have a favorite way of recording your game scores, post them in the comments below. We’d love to see what you are using!